Two randomly selected samples of Avar women in Hungary were tested. Both of them were genetically Slavic with no Asian admixture. What is the probability now that majority or all of Pannonian Avar women were genetically Slavic with no Asian admixture? Who were the Pannonian Avars/Abars then? It is particularly interesting because Avars/Abars were often linked with Abaris the Hyperborean. We must wait for samples from Avar warrior graves (and from starting period of their migration, later could be heavily mixed, but lackily they didn't cremated?). But from ancient chronicles we know that they phenotype was on Mongoloid side. We will see. Mixed south and Western Poland and western / central Ukraine. 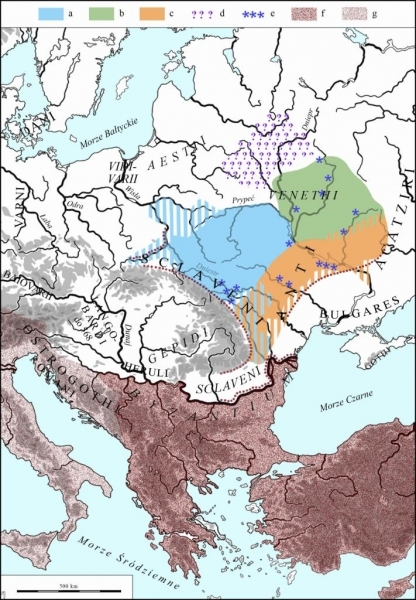 I think "Masovian-like" Av2 was form northern Slavic migration route, and Av1 from southern. Archeologists told about it as I remember? There is also slight submerged Germanic element? Av2 with penalization=0, looks mainly Slavic with minor Baltic influx - northern route. Last edited by lukaszM; 08-22-2018 at 12:26 PM. Genetic continuity in the western Eurasian Steppe broken not due to Scythian dominance, but rather at the transition to the Chernyakhov culture (Ostrogoths)? Last edited by Waldemar; 08-22-2018 at 02:23 PM. It is possible that partly "western Polish genetic makeup" of Av1 could be developed by mixing with rest-Germanen in for example Pannonia by Slavs similar to Av2. Perhaps some Slavic male warriors ("besulci") have been buried also according to the custom of the Avars before 620s AD? "The Slavs had at that point already risen up against the Avars that were known as Huns and their King Khagan. Already in the olden days were the Wends used by the Huns as the so-called befulci [besulci?] so that when the Huns took the field against a nation, they themselves would stand in muster in front of their camp but the Wends would fight. If the Wends won, the Huns would come forth to claim the booty; but if the Wends lost, they would regroup/gather new forces with the Huns’ help/protection. They were called besulci by the Huns because they walked before the Huns and had to endure a double battle in any combat." Last edited by Waldemar; 08-22-2018 at 07:53 PM. Besulci? Rather Avarish "cannon fodder"
Maybe those Slavic "besulci" were allowed to travel with their families? AFAIR, Eduardo wrote that Av1 and Av2 were mother and daughter (please note the same mtDNA haplogroup). How unusual would be to adopt a child by the nomadic warrior? BTW, Wikipedia: "According to mid-20th Century physical anthropologists such as Pál Lipták, human remains from the early Avar (7th century) period had mostly "Europoid" features, while grave goods indicated cultural links to the Eurasian steppe."